How to remove watermarks from porcelain sinks? I bought a new (ceramic) soap dispenser a couple of weeks back and now there's a watermark on my porcelain sink where I used to keep it (picture below with increased contrast). First off, I don't think it's a hard-water stain. 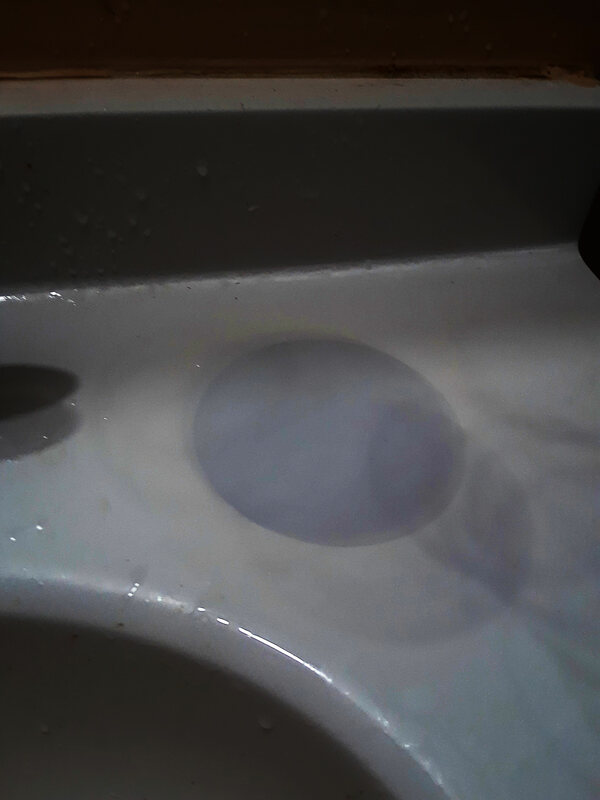 There's always a layer of water between the soap dispenser and the sink. I think this water caused the stain (it smelled very bad too -- like ammonia and rotten eggs). Any ideas on how to remove the stain? EDIT: After some investigation it seems that such stains are caused due the porcelain absorbing water. This is more common with granite counters and to prevent further staining, the granite has to be "resealed". Wipe with a paper towel with detergent, then apply chlorine bleach, small amount, let sit a few minutes then wipe off so someone doesn't come along unaware and ruin some clothes or worse get it in eyes. This can be Bon Ami with bleach, Tilex, etc., or can be chlorine laundry bleach. You will need to mix your own stain remover but here goes 3 different methods you can use. The last method use with caution and at your own risk. A mixture of Cream of Tarter and Vinegar - then use a brush. Equal parts of Cream of Tarter and Hydrogen Peroxide - then use a brush. Cottonball with Nail Polish remover - some reports say this will cause porcelain to explode apart, some say it works (it ruins marble). If you use this method - I recommend you thoroughly wash the area with water extensively and immediately. Not the answer you're looking for? Browse other questions tagged bathroom cleaning sink stain or ask your own question. Do above counter bowl sinks require special cabinets? How can I remove hair dye stains from a porcelain sink? oval undermount lavatory sinks that'd fit 18.25“ x 15.25” cutout? How do I remove mildew from walls and ceilings? How to remove stains from tile? how do I remove copper stain coming from plumbing? Porcelain toilet on porcelain tile?